Today’s recipe is actually one of my and my husband’s all time favourite. I made it for the first time in the beginning of our marriage and we both loved it. 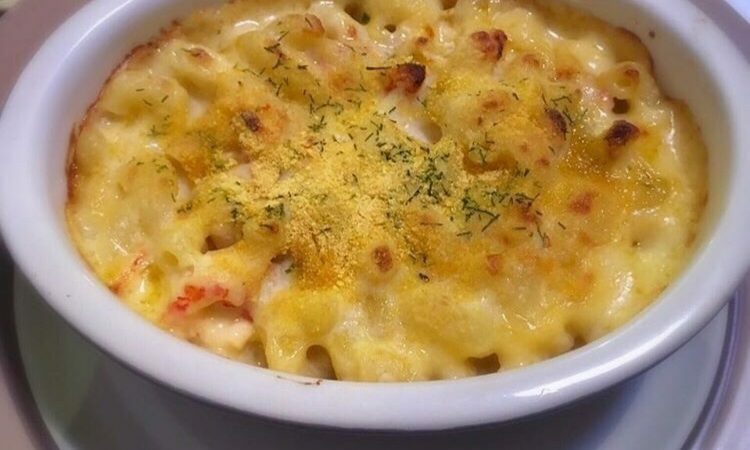 I originally wanted to make lobster mac & cheese but I couldn’t find any lobster meat and honestly I am a little scared to try cook a live lobster. In my opinion the secret to this dish is a good mixture of cheeses, you can use whichever you prefer but I found that it works best when the cheeses contrast. For example I like to use Gruyère because of it’s nutty flavour, red Leicester because of its mild flavour and dark colouring and finally I use mature cheddar because of its sharpness. Another thing that really gives this dish a kick is the breadcrumbs on top. It just gives the whole dish a little extra kick and texture. Start by preheating your oven at 200C. Now to make the sauce, melt the butter and add the flour, stir it until it makes a paste and make sure not to burn the butter. Use a low heat setting or flame. Gently pour in your milk bit by bit and whisk while doing it. Make sure to keep whisking so as to avoid getting lumps. once the whole milk has been poured your sauce should be creamy and smooth. Season with salt, chilli, pepper and paprika. You will know its ready when it starts to look thick and coats the whisk. If it sticks that means the sauce is too thick and you can fix this by adding more milk. It’s ok to add cold milk. Once cooked add in your cheeses and stir with a wooden spoon until they are melted. Take off the heat and add in your crayfish and parsley. Stir and set aside. Cook your pasta according to the instructions of the packet and drain it. Mix it with about 3/4 of your sauce and pour into your baking dish. I like to use individual ones. pour the leftover sauce on the pasta and drizzle some breadcrumbs and dill on top. Alternatively you can use breadcrumbs that have been previously mixed with herbs. Bake at 200C for about 15 minutes until it starts to bubble and golden on top. This looks so good. I am definitely going to try it as I have two little ones! Thank you! Its perfect for those cold evenings.